Pumpkin orange, mossy green, burgundy, yellow � all the colors you see in a glorious display of autumn leaves blend together in a celebration of fall. Samhain (pronounced "SOW-in, where the sow rhymes with cow) is an ancient Celtic harvest festival and the precursor to modern Halloween. 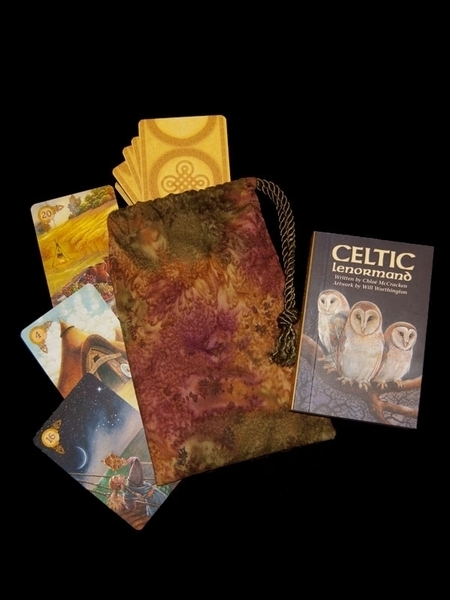 Pictured: Samhain Small Bag with book and cards from the Celtic Lenormand (book and cards not included). Size: Measures approximately 4-1/2" wide by 7" inches tall (114 mm x 178 mm). Fits rune sets and most small card decks (2.75" x 4" and smaller).